In a recent article about fast food that my son sent to me, along with a note that his new diet would consist of McDonalds French fries, the authors of Eat This, Not That! and Cook This, Not That offered their take on the worst places to get French Fries. 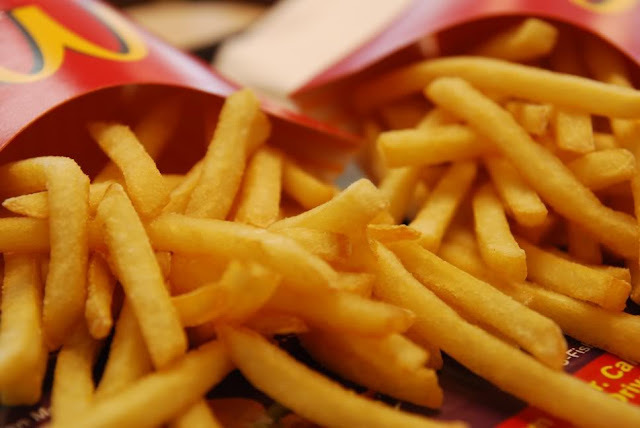 But don’t dwell on the bad… A surprising winner, McDonalds was crowned the Best Fast Food Fries in America because a small order is just 230 calories, 11 grams of fat (1.5 Grams saturated) and 160 mg of sodium. No more guilt when it comes to indulgence. But then, there are those Ore-Ida fries that weighed in at a mere 8 grams of fat. I had them for lunch today!